It is said that members of this class will share a song from deep in their hearts to all in their Realm, while those from other Realms get a lute to the head! 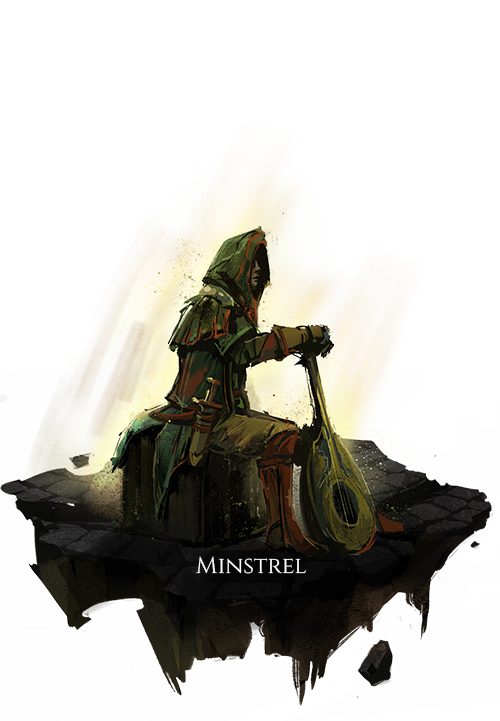 Minstrels use the power of song to aid fellow Arthurians in their travels, making the miles fall away faster and stiffening their spines during battle. The earliest Minstrels were known to wander the Realm, recording the hardships and triumphs, successes and failures, of all. Their songs spread stories of heroism among their fellow survivors, as well as stories of King Arthur himself. With a song for our friends, and a blow to the skull for our enemies. The power of song abilities is reduced over time with use, and takes time to recover full effectiveness. Weapon abilities used while maintaining a song deal greatly reduced damage. Song abilities gain bonus power when combined from multiple users of the same song within a group. Song abilities which affect enemy targets have their power increased based on the number of targets affected. Greatly increases the power of song abilities, and reduces the effect of Fading Melody. Provides an aura that increases the movement speed of the player and nearby allies in their group. Damage taken while under the effect of this aura breaks the effect, and applies a physical debuff that prevents song effects for a brief duration. Provides an aura that damages nearby enemies and reduces their resistance to poison and disease effects. Increases song ability radius and initial power, but increases the effect of Fading Melody. The user’s current song spreads across a massive range by consuming the user’s remaining blood over a moderate duration. A giant lute will appear near the dying user’s head and their current song will persist beyond their death for a long duration. The lute gains additional power based on the number of wounds on members of the user’s group.